David Orchard will speak at the end of the morning session to address some of the key questions and sum up the discussion. Tickets $12, available at the door. CKNW Radio 980 AM, "Bill Good Programme"
Marjaleena Repo, Senior Advisor to David Orchard and Duff Conacher, Democracy Watch, discuss the trend towards lower voter turnouts in Canada's federal elections. David Orchard, Anne Medina, Host of History Television's History on Film, and Sylvia Bashevkin, University of Toronto Professor of Political Science, in a 1/2 hour discussion about the outcome of the Canadian federal election. David Orchard interview and phone-in show. CBC Radio - "Wild Rose Forum"
CPAC TV - "Campaign Politics"
Catherine Lathem takes an in-depth look at the riding of Saskatoon-Wanuskewin (Sask.). Her report includes a recent visit to David Orchard's farm which is celebrating its 100th Anniversary this year. This will be the first television interview David has given at his farm. More detail at CPAC's Campaign Politics. The interview may also be shown on Prime Time Politics, 8:00pm ET weeknights. "On election night will you be voting for or against a political party? Many Canadians will be breaking party loyalty this time around and they aren't alone. This week on Global Sunday former Liberal Senator Anne Cools and former PC leadership hopeful David Orchard square off on their decisions to part company with their traditional parties." Transcript will be posted here. Tuesday, April 27, 10:30 am. Appeal Hearing, Merger case, Ahenakew vs MacKay. Appeal of December 5, 2003 ruling by Justice Juriansz in the Canadian Alliance - PC Party merger case. Thursday, April 8, 2004 2:30 p.m.
A Forum on Conservatism; "What Does It Mean To Be Conservative?" The Department of Political Science and The Canada Research Chair in Social Justice presents A Forum on Conservatism; "What Does It Mean To Be Conservative?" featuring David Orchard, with Commentaries by Professors John Whyte and Shadia Drury and Moderator Dr. Allan Cahoon (V.P. Rsearch). The demise of the Progressive Conservative party and the creation of the new Conservative party raise questions about what it means to be conservative. Does the term 'conservative' mean anything at all? Or has it become meaningless? David Orchard, who has played a significant role in the now defunct Progressive Conservative party, will tell us what it means to him to be conservative. Shadia Drury will argue that conservatism is a dilemma that is integral to the human heart—we are all conservatives at heart even if it is impossible to be conservative. John Whyte will explore the transformation of conservatism that is going on before our eyes. The programme is archived here. There is a slight pause between part 1 and part 2 (32:17 minutes total). David Orchard interviewed by Rick Howe on the "Hotline" broadcast in Halifax and in parts of Nova Scotia. The programme is archived here. David Orchard debates Rod Love, Reform-Alliance strategist and longtime unite-the-right proponent on Stephen Harper's winning the Conservative leadership race. Airs Alberta-wide, on 1010AM in Calgary and on 740AM in Edmonton. The programme is archived here. CBC Radio Saskatchewan "Noon Edition"
If you miss the programme, you'll find it archived on the same page: follow the links to "latest show." There's also a "frequency guide" for locating CBC Radio in your area. Link is on right side of page. Saturday, March 20, 2004, 6:00 p.m.
Tickets can also be picked up at 489 2nd Ave North, Saskatoon, between 10 am - 5 pm. Report on Business TV, "Squeeze play with Kevin O'Leary and Amanda Lang"
David Orchard will be on live ca 5:45 p.m. ET to comment on the Conservative leadership race. Please check local listings or channel. Sunday, March 7, 2004 1 - 5 p.m.
Saturday, March 6, 2004 5:30 p.m.
4235 Departure Bay Road, Nanaimo, B.C. NEW TIME is 9:00 a.m.
Thursday, March 4, 2004 7p.m. Monday, March 1, 2004 7 p.m.
Sunday, February 29, 11:30 am - 2:30 pm. Luncheon with David Orchard "Greet, eat, and meet"
A chance to meet and talk, and hear from David about the developments since the unceremonious extinguishment of the Progressive Conservative Party of Canada. $20 per person (taxes and gratuity included). The 78th Annual Greater Edmonton Teachers' Convention: "Renewing the Spirit"
David Orchard will speak on "Free trade: Fourteen Years After" in the Shaw Centre, Salon 9, at 9 -10:15 a.m. on Friday, February 27. Dr. Michele Borba, educator and award winning author of many books, including Building Moral Intelligence: The Seven Essential Virtues that Teach Kids to Do the Right Thing on "how to develop students' moral intelligence." Barbara Coloroso teacher, consultant on conflict resolution, and author of Bully, the Bullied, and the Bystander: From Preschool to High School-How Parents and Teachers Can Help Break the Cycle of Violence topic of bullying and the tools to break the cycle of violence. Steve Dotto, host and executive producer of a popular Canadian TV programme on computers, "Dotto's Data Café," on the topic of "Technology and Education"
Linda Edgecombe, Canadian wellness consultant, "Life Perspective Specialist" and author of Batteries Included: Lessons to Balance and Energize Your Life on "how to show up energized and continuously finding new perspectives." Dr. Kevin Gottlieb, Professor in the Department of Public Administration at Syracuse University's Maxwell School and President of the Washington, D.C. based Kevin Gottlieb & Associates, Inc., which focuses on public policy analyses, executive education and grassroots constituency development, on "Growing the Grassroots: Educating Policy Makers." Deborah Grey, former teacher, Conservative MP for Edmonton North and the first Reform Party of Canada Member of Parliament elected to the House of Commons, on "Fifteen Years in the Classroom of Parliament." Johnny 'Bagpipes' Johnston, Canadian comedian and bagpipe player, in a one-man session of comedy with bagpipes. Brian Keating, Head, Conservation Outreach, Calgary Zoo, anthropologist and world traveling wildlife conservationist on "Cold Leadership: the Extraordinary Capabilities on Antarctic Explorer Ernest Shackleton." Michael Kerr, Canadian and international business speaker, trainer and author of You Can't Be Serious! Putting Humour to Work on how humour can help manage stress at work, spark creativity and, boost morale. David Orchard, farmer, politician and author of the best selling book, The Fight for Canada: Four Centuries of Resistance to American Expansionism, on "Free trade: Fourteen Years After"
Bill Richardson, writer, humourist and host of CBC Radio's "Richardson's Round-Up" on "Frequently Asked Questions," how everyday stories of everyday lives become the building blocks of a radio programme. 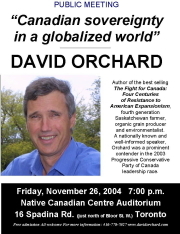 Thursday, February 26, 2004 7 p.m.
David Orchard on "Fourteen years of 'free trade': implications for Canadian sovereignty." A free, public talk sponsored by the Alberta Public Interest Research Group. David Orchard will be on CPAC's "Primetime Politics" to talk about his court suit against the Conservative Party for illegally withholding $70,000 of his leadership campaign funds. The programme airs live on-line... Click here to view. Sunday, February 22, 2004 11:00 am - 2:00 p.m.